Robert Morris Jr. (January 31, 1734 – May 8, 1806) was one of the 56 signatories of the Declaration of Independence. In addition to that, he was a signatory of the Constitution of the United States of America, and the Articles of Confederation. 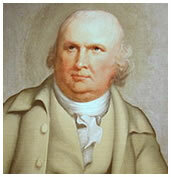 Morris Jr. is also known for being a prominent member of the Second Continental Congress. Robert Morris Jr. played a very important role regarding financing the American segment of the American War of Independence. Morris Jr. was born in Liverpool and moved to the USA at the age of 13 to live with his father, Robert Morris senior. Morris Jr. was a very quick learner and soon after he finished his studies, his father sent him to Philadelphia where he became an apprentice at a local shipping company. One year after that, his father died after being wounded by the wadding disk of a ship’s gun which had been fired in his honor. Three years after Morris moved to the USA, he became an apprentice to the shipping company of one of the most important people in the city. After the owner of the shipping firm died, Morris (who was only 18 at that time) became the associate of his son, Thomas Willing. Together they established a shipping company that lasted for more than twenty years. Their firm sent ships all the way to Asia and the Levant and it soon became one of the most important shipping firms in the state. This is what made Robert Morris not only rich, but also highly influential in Pennsylvania. Although he was very wealthy for that area, his fortune paled in comparison to the fortune of plantation owners or the Englishmen that lived in the United Kingdom. At 35, Robert Morris Jr. married Marry White, a woman from Maryland who was fifteen years his junior. Together, they had seven children. With regards to his religious life, Morris worshipped the Anglican Church throughout his entire life. Other prominent members of the Continental Congress worshiped at the same church due in part to reputation of the church and its convenient location. At 53, Morris Jr. was chosen to attend the well-known Constitutional Convention. Despite the fact that Morris said very little at the Constitutional Convention, his lawyer and his former assistant were very vocal there and they strongly opposed slavery during the meeting. Even so, Morris had a very important role in the Convention, since he was the one to nominate George Washington as the president. Morris Jr. declined George Washington’s nomination for the Secretary of the Treasury two years later, suggesting another candidate instead. Morris Jr. served as a US Senator for 6 years. He was a great supporter of the Federalist party, due to the fact that this party's economic proposals involved the improvement of lighthouses and canals in order to help commerce. In addition, he also supported the economic proposals of Alexander Hamilton which were actually nothing but a rework of a report that Morris prepared 10 years before Hamilton's proposals. With regards to the residence of Robert Morris Jr., he moved from his house in Philadelphia and allowed George Washington to use it as his residence. After that, Adams used the same house as well during his presidency.